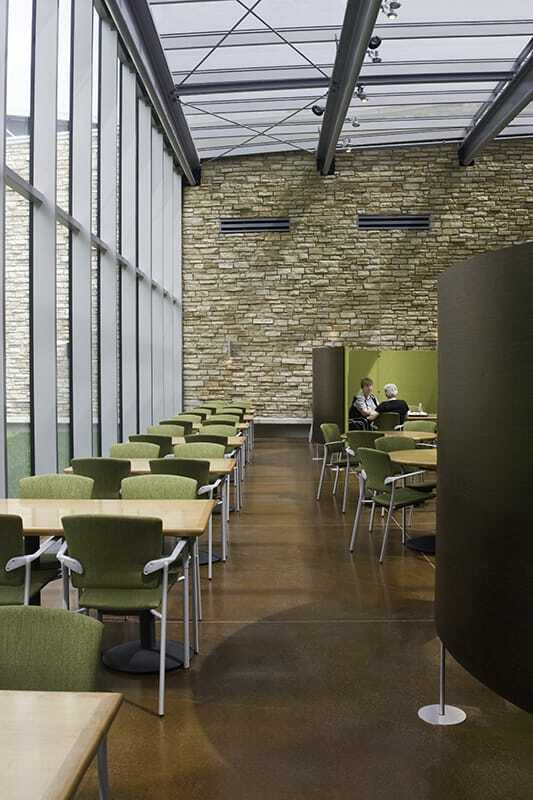 The facility is an architectural cast-in-place concrete building with a 33,000 SF green roof connected by a 5,000 SF skylight. Building A consists of dining area, company store, bank, coffee bar, and rest rooms while Building B houses the main kitchen, servery, pizza bar, café seating and back of house operations. 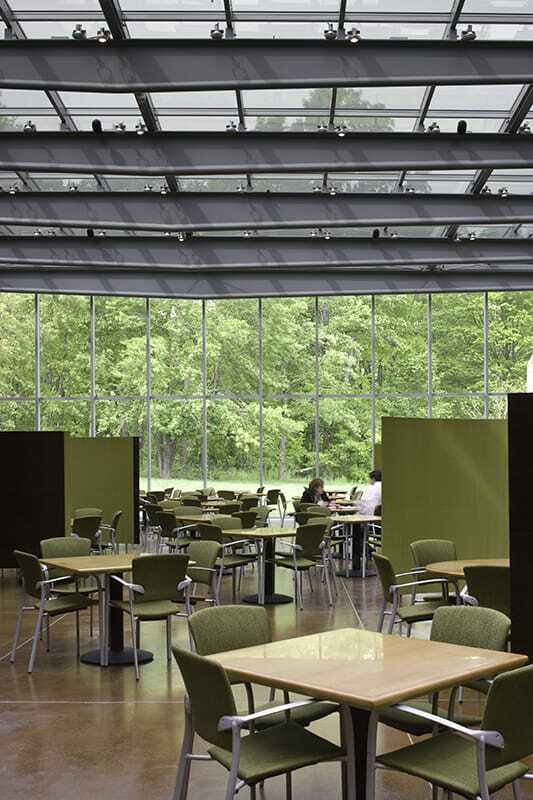 The 5,000 SF skylight and curtain wall ties the two buildings together and create a unique dining space with glass and stone running though the building having a view of the outside. The exterior terrace on the north and south creates additional seating outdoor. 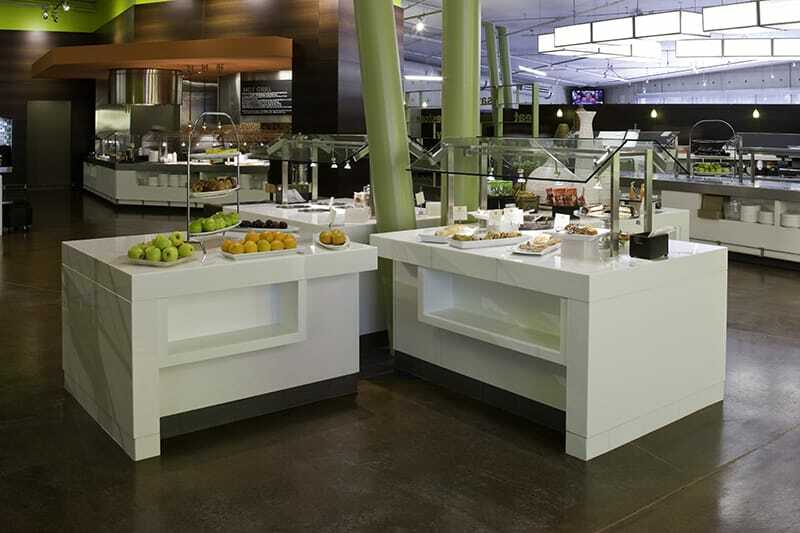 The dining areas have table, banquette seating and high-top table seating. Connectors to the existing Howe and Becton buildings complete the site by tying all the campus buildings together. High end finishes consists of wedge wood paneling, prodema exterior siding, polished concrete, and stainless steel glass stone. 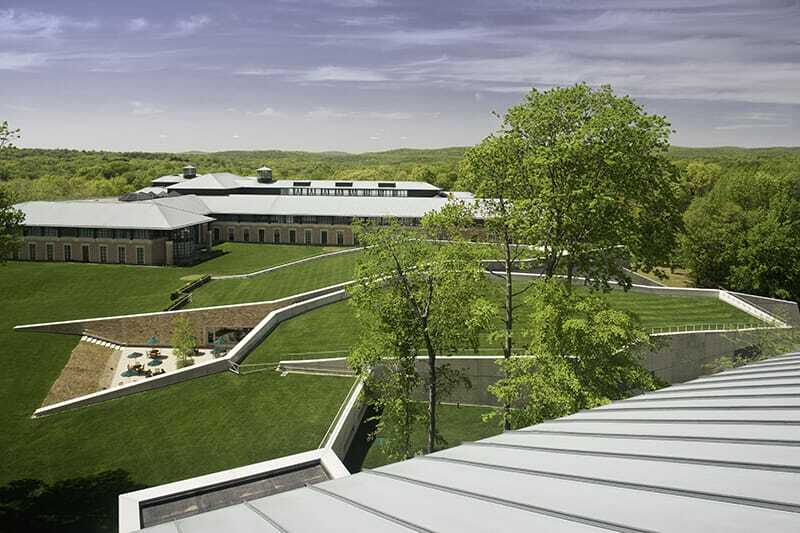 The construction management team had to come up with a deck forming system that could be sloped in multiple directions (compound slopes) in order to create drainage of the sod-covered roof to the sides of the structure not to shed the drainage end wall. Once the deck was in-place, placement of concrete on the sloped deck needed to be surveyed while placing concrete in order to match the required finished slopes. Additionally, the rate of placement of the concrete was important to ensure it did not sag. The deck forming system was successfully sloped in multiple directions (compound slopes) allowing drainage of the sod-covered roof to the sides of the structure and does not shed the drainage end wall.